The Canon EOS 5D Mark III is finally real and so now it's time for bargains on its predecessor—sort of. Canon will continue to produce the legendary, full-frame, HD shooting 5D Mark II and the company is hinting at price break next week. So you held off on buying the legendary Canon EOS 5D Mark II in hopes that you'd get a bargain-basement price when the long-anticipated successor DSLR came out. Well you were partially right in that the 5D Mark II is probably going to drop in price. Canon told us the $3500 5D Mark III isn't a replacement for the Mark II. The new camera will serve as a stepping stone between the Mark II and the low-light annihilating, $6800 Canon EOS-1 DX. The company also told us that they'll be announcing a new pricing schedule for the Mark II. Makes sense to us! 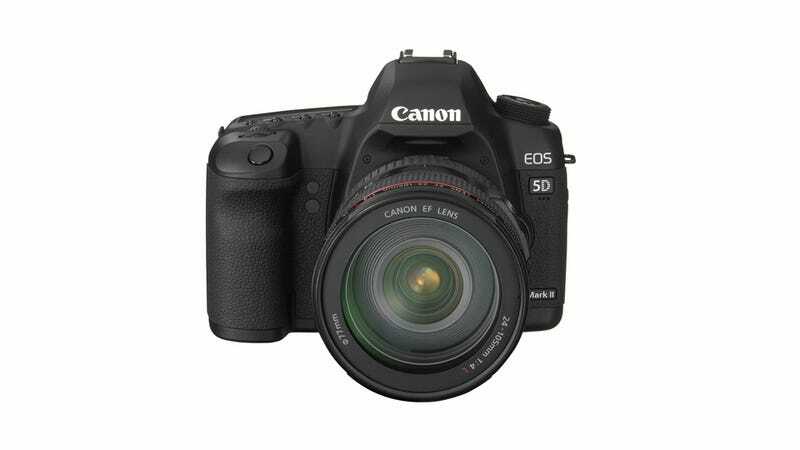 For now, the 5D Mark II still costs $2500, but you can expect news of an enticing price break in the coming weeks. Sorry, we've got not idea what the new price is, but we're pretty darn sure it's not going up. If you were hoping for a clearance sale, you're out of luck.